Camping is a great way to escape the distractions of daily life, but that doesn’t mean you have to give up all technology. It’s still just as enjoyable to relax at the end of the night with your favorite film or show. However, there are important factors to consider when TV-shopping for an RV because the device needs to be able to withstand the inevitable motion and weather conditions that come along with travelling by vehicle. 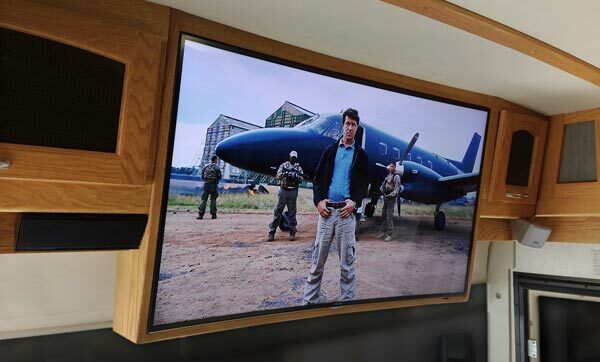 Before going out to purchase your new TV, it is important to consider what you will primarily be using it for and what kinds of models will fit best in your RV. Do you prefer to use a streaming service like Netflix, do you like to have access to local channels, or do you need an option that allows for both? If you do must of your viewing online, then a Smart TV with Firestick technology is probably the way to go. You can access all kinds of streaming services and apps, usually using a convenient voice control remote. If you prefer to watch local channels, then you will need to get an antenna for access. If you want DirecTV, you will need to get a special dome antenna for the outside of your RV. There are also TVs that can offer a mix of both. Even if the TV is not compatible with Smart technology, most will at least have an HDMI port where you can plug your laptop in and stream that way. Many models are 12-volt, which means they can be plugged into a vehicle while it is driving. Some also use AC or DC power. Make sure the type of power works with your RV power source. Most RV TVs have screens that are about 20-24 inches diagonal, but of course there are smaller and larger options available as well. Pick a model that fits your preferences. Some people need the scope and quality of a big screen while others prefer a thin and unobtrusive model that can be mounted so it doesn’t take up too much space. Both types work as long as you have a way to secure them. Many RV TVs come with wall mounting brackets, but you can also use a stand or straps. Once you have thought about the best kind of TV for your situation, take a look at our favorite models. Each one is the leading product in its own category. 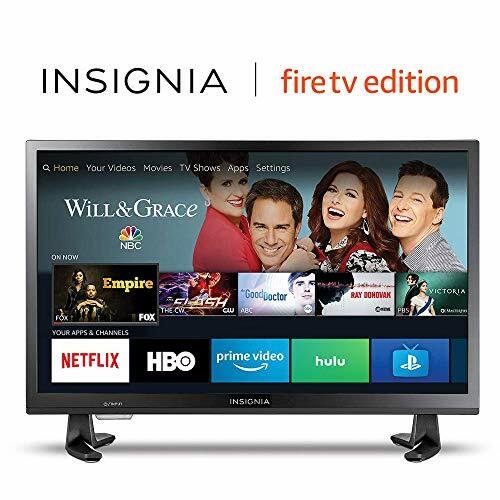 Top of the list in quality and value, this Smart TV provides clear picture and great sound with the necessary durability to travel around in an RV. The screen is 32 inches wide, which is big enough to enjoy all kinds of media without having to sacrifice a ton of space. 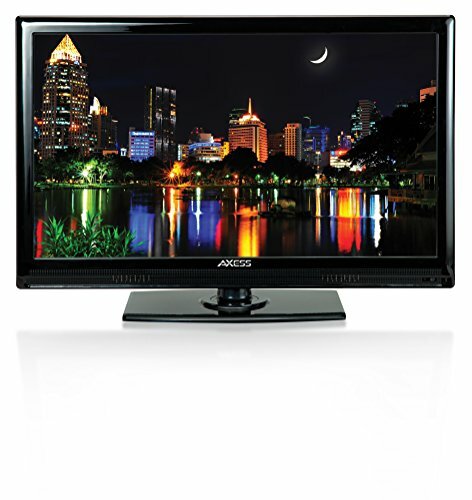 The 720p HD picture quality will give all of your favorite movies and shows lifelike quality with vibrant colors. It is a Smart TV, the Fire TV Edition, with over 10,000 built-in channels and apps and Alexa capabilities. You can easily access a variety of networks, including Prime Video, Netflix, HBO, Hulu, STARZ, and SHOWTIME. Since it has Alexa, every feature can be controlled using your voice. This model is fairly versatile. The input/output allows you to connect three HDMI cables (including one with ARC), a composite input, a USB, digital output (optical), antenna/cable input, audio output, and Ethernet. It is also super easy to install. You just need to place it in a secure location, plug it in, and connect to WIFI. If you prefer, you can buy the version that comes with a stand, although we advise against using that kind of set up in an RV. When you order this TV, you also receive the voice remote with Alexa, two AAA batteries, a Quick Setup Guide, and, if you ordered one, a stand. 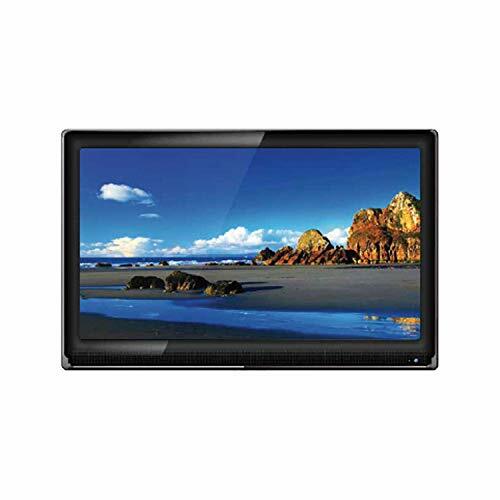 Overall, this is a high quality and portable TV available for a great value. It is small enough to be easily secured and transported in an RV, but you don’t have to sacrifice any of the great features of a modern TV. Using the battery-operated remote voice control, you can access thousands of movies, shows, music, and more. TVs are often one of the priciest accessories in an RV. If you want a great product that won’t break the bank, this HDTV model from SuperSonic is an excellent choice. It utilizes liquid crystal technology for clear and vibrant picture quality complete with 1080 progress scan capability for smooth motion. For an RV, the 22-inch version is the perfect middle ground. However, if you prefer something a little smaller or bigger, they have seven other screen sizes ranging from 13 inches to 40 inches. It includes ports for HDMI, USB, and AC/DC, so you can easily connect a smart remote to access more channels and apps like Netflix and HBO. The AC/DC compatibility is an important feature for RV use because it allows you to use it on the go without a problem. There is also a feature that allows for PC input, so the monitor can be connected to a computer. This model is perfect for RV use and easy on the wallet with high quality picture and smooth motion. The speakers are fairly small, just like the TV itself, but they are good enough for close-viewing in a cozy RV setting. It also has ports that allow you to connect different devices so you can access a wide variety of channels and apps on the go. There’s good reason this one is a user favorite. 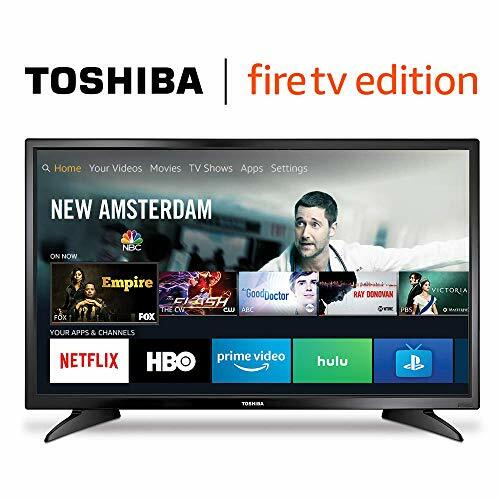 This HD Smart TV complete with Fire technology allows you to access countless channels and apps while you camp, including Netflix, Prime Video, Hulu, HBO, SHOWTIME, and STARZ. It provides rich and vibrant color with 720p picture quality. Controlling and navigating the different features is easy with Alexa voice remote control. You can do everything from switch inputs to search for movie titles just using your voice. Setting it up is a breeze. You can purchase it with wall mounts or a stand, depending on where you want it to be in the RV. There are input ports for an RF antenna, composite video, USB, Ethernet, and three HMDI. The output ports are compatible with digital optical audio, headphones, and analog audio. If you want to integrate live and streaming TV channels, all you need is an HD antenna. The TV also comes with a Quick Setup Guide, the voice remote with Alexa (and two AA batteries), and a stand if you added one. Like the SuperSonic 1080 LED TV, the sound system could be stronger. Luckily, this does not make a big difference in a small viewing environment like an RV living room. Along with providing a quality viewing experience, the Fire TV technology allows you to do so much more with just one device; you can play music, order food, and play video games all on the same screen. Who says camping can’t include a little bit of luxury? Take some time to enjoy a modern comfort and watch movie or show on a flat screen TV like one at home. It may not seem practical to bring along a flat screen in an RV, but this LED TV is actually specifically designed for RVs and campers. It can easily be mounted to a wall or balanced on a tabletop with the included stand. 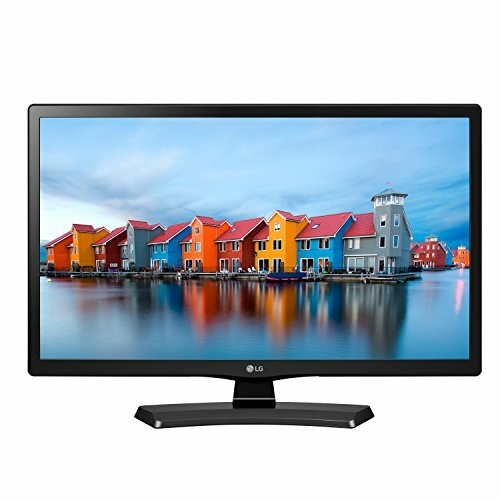 This model is lightweight and mobile while boasting HD picture quality and 1366 x 768 resolution. It is also energy efficient; it uses less than 49 watts. It has a simple 12-volt DC-powered flat panel TV with three HMDI input ports so you can connect it to your computer to stream movies and shows. If you use a CHD 1260 Power Brick Adapter, you can convert it to AC as well. There is an included battery-operated remote so you can easily navigate through different channels. If you want the at-home theatre experience while you’re on the move, this model is the perfect solution. You don’t have to sacrifice picture or sound quality just because you’re traveling. 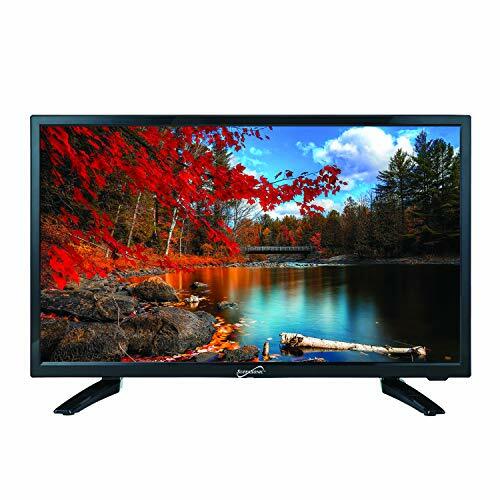 This TV delivers in both areas and the manufacturer offers free technical support if you ever run into difficulties. It isn’t as versatile as some other options on our list, but sometimes it’s best to keep things simple. With three HDMI ports, it is still possible to connect to a computer to stream content. In contrast to the Free Signal Flat Screen TV, this model from LG Electronics is for those who prefer to have all of the extra gadgets and features along for the ride on every trip. The TV has built-in Wi-Fi, so you can stream content from Netflix, YouTube, Hulu, and hundreds of other services. In addition, you can access movies and shows wirelessly through Bluetooth or screensharing Mirecast and WiDi connectivity. There are two HDMI ports as well, so you can connect a laptop for other viewing options. It is lightweight and compact, weighing just five pounds with a 24-inch screen. The bright LED technology, wide viewing angle, and 1366 x 768p HD display make for realistic and vibrant picture quality. You can choose between mounting brackets and a TV stand for set up. It is recommended to use the mounting brackets for an RV so the TV is more secure. Mounting the TV is simple and only takes about 15 minutes. You don’t have to leave your favorite Netflix shows or YouTube channels behind when you camp. This model provides a wide range of viewing options with a simple and straightforward design that makes it easy to navigate. It is compact and a breeze to install, making it a perfect companion for RV traveling. Like many other small TVs, its sound quality is limited and there is no audio port where you can plug in headphones or speakers to enhance it. However, the LED and HD display ensure the picture is vibrant and top-quality for an immersive experience. You can always access streaming services from your phone or tablet, but it can be more difficult to find portable options that allow you to watch your favorite TV channels. This model comes with a portable satellite antenna, so you never have to leave those channels at home. There are also built-in apps like Netflix so you can still stream when you like. To set it up, all you need to do is install the lightweight DISH receiver. It is 16 inches in diameter and 13 inches tall and only weighs seven pounds, so it does not take up too much space. 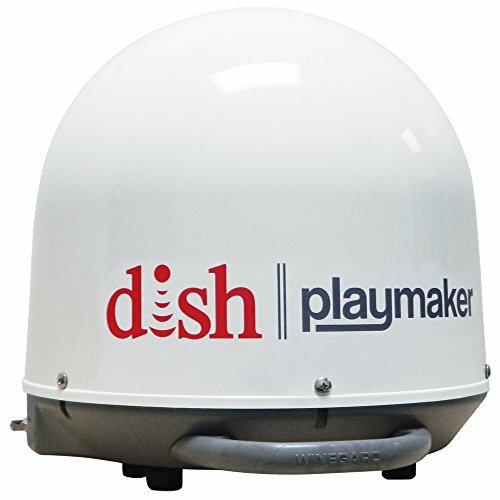 The receiver is powered by a single coax connection and it automatically connects to DISH HD satellite orbital locations so you can watch thousands of channels from the comfort of your RV. The antenna only works with DISH HD solo satellite receiver technology and programming, so it is compatible with wally, viP 221k, viP211z, viP 211, and 411 solo HD DISH receivers. It utilizes a high-strength, military-grade aluminum reflector for 20% better signal strength than previous models. This TV from Winegard is the best of both worlds. You can access satellite channels and streaming all on the same screen. Even better, it is designed for RV use, so it is easy to set up and transport. The mounting kit has to be purchased separately, but once you have it, it is simple to install. The top-quality aluminum reflector boosts the signal, so you are able to access the channels in more areas than before. TVs like this one from AXESS are excellent for travel because it has a 12v cord adapter that allows you to charge power from an RV or car. It has a 24-inch screen and is very thin, so it is easy to lift and mount. It has a max resolution of 1920 x 10180, a contrast of 1000, an aspect ratio of 16:9, and display colors of 16.7M, which all translates to vibrant and crystal-clear picture quality. It runs on AC power supply. There is a built-in digital and analog tuner, so you never miss your favorite shows. It also has ports for HDMI and USB, so you can connect other devices to stream. There is a VGA PC input, an audio PC input, and a 3.5 mm headphone jack, so you can plug in other speakers and devices if you want to enhance the sound quality. In addition, it has inputs for a cable/antenna jack (RF input), Component, and CVBS and audio LR. It can also support a coaxial output jack. All features are controlled with the full-function remote control that comes with the TV. If you want a DVD player, you can also buy a version of this model that has one built in. Mobile and versatile, this TV is easy to bring along on a long trip. The 12v adapter is convenient for travel since you don’t need to wait until you’re hooked up to electricity to use the TV. 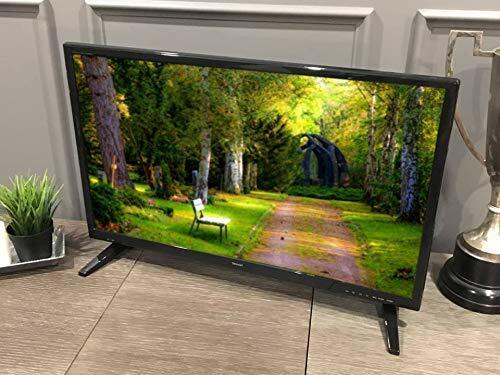 Like many other smaller TVs, its sound quality could be stronger but luckily this model has multiple ports that support headphones and speakers, so you can easily increase the sound by connecting one of those devices. Furrion is one of the most well-known exploration companies out there and they make many quality products for RVs and campers. Their 24-inch LED HD TV is no exception. It is a durable and long-lasting model with vibrant picture quality. This option is designed to withstand all kinds of obstacles you may encounter while travelling. It is designed and tested for vibration resistance and extreme climates. There is metal plating to provide sturdy and durable support for the electronic and wall mounting features. The wall mount brackets are connected to the metal framing, which helps reduce pressure and prevent damage from vibration. There is also silicone glue in the circuit board for further protection against vibration. The ports can support VGA, USB, AV IN/AV OUT, YPBPR, and headphones. There are three ports for HDMI. It also comes with upgraded Furrion speakers and an amplifier for high quality sound. If you want a TV that is long-lasting, high quality, and versatile, then this is the perfect choice. Every feature on this model is tested and designed to remain intact across the bumpy roads and adverse weather conditions you will inevitably encounter on some point during your travels. On top of that, it leads the way in picture and sound quality. Most RV TVs come with a mounting bracket. If not, you will have to purchase one separately or buy a stand. Many mounting kits come with 1-2 wall brackets, a removable articulating arm attached to a mounting plate, and the necessary screws and anchors to attach the other pieces to the wall. Once you have found the perfect location for your TV, check the wall to make sure it is thick enough to support all of the pieces. Sometimes the nails may be too long and could go all the way through the wall since RV walls can be quite thin in some places. If the walls are too thin, you can also attach it to something sturdier like a cupboard and adjust the articulating arm to put the TV in the right position. Use a pencil to mark where you want the top and bottom sections of each mount to attach to the wall. Then drill the screws in to secure the mounts to the wall and then connect the mounting piece on the back of the TV. For a more detailed tutorial on mounting a TV in a room without an outlet or through thin walls, watch the video below. There are a wide variety of options out there that allow you to unwind at the end of the day with your favorite movies and shows no matter where you are. Like many RV products, it is important to find a TV that meets your needs and has a design that will allow it to function on the road. Can You Get Cable in an RV? To access cable, you need to be able to connect to a cable hookup. Many RV parks and campgrounds will offer a hookup for RVs, but some charge for using it. If you want to access TV channels, a portable satellite or antenna will allow you to receive more shows on the go. Can You Watch TV While Driving RV? If your RV has a built-in generator, you can connect and use a 12v-powered TV or other electronic devices while the vehicle is in motion. However, it is very important to consider safety first. The TV should never be in a place where it can distract the driver.